The group spent their first night in Chile in the Southern Patagonian hub of Punta Arenas, situated on the Magellan Strait. 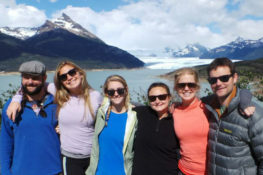 The next day, they enjoyed the incredible scenery as they drove the approximately 4-hour trip into Torres del Paine National Park, where they would get to see some of Patagonia’s most famous sights. 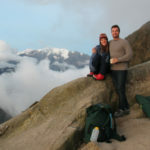 Spending a few days within the park at a luxury adventure lodge, Nancy, Jeff, Mary, and Kevin were able to be as active and relaxed as they wished, selecting their adventure activities for the following day each night. After their stay in Torres del Paine, they moved on to the town of Puerto Varas in Northern Patagonia, or, as the area is also called, The Lakes District. While in Puerto Varas, they took in their surroundings both on horseback and from the water while rafting through rapids. From there, they headed further north, spending the final few days in Valparaíso and Santiago before heading home from their custom adventure through Chilean Patagonia and beyond. When asked how they liked their trip the group replied, “everything was fabulous, and all of it moved like clockwork.” Keep reading to experience the wonderful custom Chile trip these friends put together with the help of Jordan, Knowmad’s Co-Founder and a Chile & Argentina Trip Specialist. 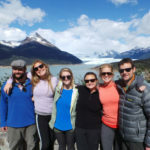 Do you want to travel to Patagonia and/or create a custom Chile trip of your own? We’re regional experts here at Knowmad Adventures and pride ourselves in building custom trips that are a perfect fit for our travelers. If you’re interested in crafting an adventure combining several regions in Chile but this particular itinerary doesn’t strike your fancy, don’t hesitate to reach out to our Trip Specialists at 612-394-2894 or travel@knowmadadventures.com to begin planning your trip today! You will take an overnight flight from the U.S., arriving in Santiago the following morning. Upon arrival in the Santiago airport, you will be responsible for independently checking in and catching your onward flight to Punta Arenas. Arriving in Punta Arenas, you will be met at the airport and transferred to your centrally located accommodations. The evening is yours to spend independently at your leisure. Perhaps visit the main square, located only a few blocks from your accommodations, or make the short hike to the Cerro de la Cruz to look out over Punta Arenas and the Magellan Strait. In the morning you will be picked up at your accommodations by an Explora representative and taken on the scenic, approximately four-hour drive through Puerto Natales and onward into Torres del Paine National Park. En route you will stop at a local restaurant for a light meal as well. While at Explora Patagonia you will be able to choose from a wide range of adventurous excursions, as well as enjoy gourmet food and a range of wines and alcohol as part of your adventure inclusive package. Enjoy panoramic views of the startling blue lakes, glaciers, and rock formations during your stay at Explora Patagonia. Your on-site Explora guide will explain the multitude of options upon arrival, as well as aid you each night in planning out your activities for the next day. Continue enjoying your adventures throughout the region and your stay at Explora Patagonia. Park highlights include the Grey Glacier, the French Valley, and the Base of the Towers in addition to horseback riding and other hidden gems. After enjoying your morning and lunch at Explora you will be taken on the approximately 4-hour transfer back to Punta Arenas and your charming accommodations just a few minutes from the main square and the Strait of Magellan. Enjoy the evening at your leisure. This morning, you will be met at your accommodations and be transferred to the Punta Arenas airport in accordance with your onward flight to Puerto Montt. Upon arrival you will be met at the airport and transferred to the nearby city of Puerto Varas, situated on the serene, picturesque Lake Llanquihue. Enjoy the rest of the day at your leisure, perhaps walking along the shores of the lake or discovering the charming German influences on the city. Today you will be picked up at your accommodations by a group transfer (Spanish-speaking driver only) and taken for a half-day rafting trip on the class III Petrohué River. (Please note this is a shared guest transfer.) 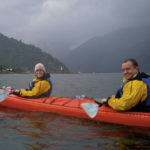 Voyaging through Chile’s first national park with your small group, this exciting adventure is filled with exhilarating rapids, beautiful turquoise waters, and views of multiple volcanoes throughout. The first rapid called Ciao Seco (“goodbye to dry”) will begin your 13 kilometers of continuous fun. Enjoy the beautiful scenery as you raft with your small group, and a small snack is also included to keep your energy up as you paddle. After rafting you will be taken in group transfer back to your accommodations to enjoy your afternoon at leisure. 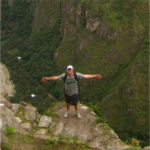 *All of the trips at Knowmad Adventures are custom. 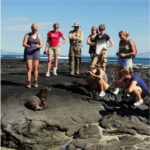 Excursions, like the rafting pictured above, are discussed during the trip planning process and are tailored to suite the travel style of each group. Today you will embark on a custom Bike & Brew experience (please note that this excursion is in small-group basis). You will be met at your accommodations and, leaving Puerto Varas, you will be driven to Frutillar (Spanish-speaking driver only), a charming village noted for the German influenced architecture and farmland developed by the immigrants who arrived around 1853. Here, you will meet up with your guide, and begin your bike ride south as you enjoy the beautiful views of the lake and volcanoes. Then, you will continue to the picturesque town of Llanquihue, an old industrial town nearly unknown to the traditional tourist circuit. At the end of your 31-kilometer ride you will arrive at the Chester Beer brewery, owned by Derek Way. Derek has been producing traditionally brewed beer for 10 years, and this brewery is the result of years of effort in providing good beer to his friends in Puerto Varas. Enjoy the refreshment at the end of your journey. From this brewery you will be returned by vehicle (Spanish-speaking driver only) back to your accommodations in Puerto Varas for a relaxing afternoon. After enjoying the morning at your leisure, you will be met at your accommodations (please have your bags packed and be ready to depart) and transferred to the Puerto Montt airport in accordance with your onward flight to Santiago. Upon arrival, you will be met by a Knowmad Adventures representative and driven approximately 90 minutes to your accommodations in the coastal city of Valparaíso. Declared a UNESCO World Heritage site in 2003, Valparaíso is recognized for its architecture, cultural significance, and vibrant charm. In the morning you will be met at your accommodations to enjoy a full-day guided exploration of Valparaíso, where the picturesque layout enhanced by the surrounding hills that dive into the ocean remind us that it was once the most important South American seaport of the Pacific coast before the Panama Canal was opened in 1914. You will visit both the downtown and the colorful hill neighborhoods of ‘Valpo’ where century-old hillside ascensores (elevators) rise up into the city’s steep hills and a labyrinthine maze of streets reveals brightly colored buildings, bohemian cafes, elegant restaurants and spectacular views of the harbor below. Your optional lunch (to be paid direct by travelers at restaurant) in Valparaíso will also be nestled in the beautiful hills. After your guided exploration of this unique city you will be transferred back to your accommodations to enjoy the evening at your leisure. Enjoy the morning and lunch independently at your leisure. In the early afternoon you will be met at your accommodations and be driven approximately 90 minutes to Santiago for a half-day privately guided exploration. Your bilingual guide will lead you on a tour featuring Santiago’s most important historic and cultural sites. You will begin at the beautiful park on Santa Lucía Hill, and nearby you will continue on to the governmental seat of Palacio La Moneda, the House of Justice, and the National Parliament. Along Plaza de Armas, the main square, you will visit the Cathedral and view the majestic architecture of the Post Office and governmental buildings. Also, if the weather is clear, perhaps overlook the city from the top of 300-meter San Cristóbal Hill. Enjoy sightseeing and people watching in this city that has been bustling with life from colonial times to present day. At the end of your excursion you will be transferred to the airport in accordance with your international, overnight flight home. Note: This post was originally posted on October 26, 2017 and was adjusted to include the most up-to-date information on April 18, 2018.